Everyone, White Oak is having a moment. This is not your mother’s kitchen from 1984—I promise. In fact, this classic American hardwood is being served up in a sophisticated, subtle way across the commercial design landscape. From trendy retail stores to modern restaurants, White Oak is white hot, and we don’t see it burning out anytime soon. Here are our favorite White Oak looks and trends. If you’re still thinking White Oak is used for just wide plank flooring or cabinets, think broader. Now think rounder. Right now, we are seeing (and loving) White Oak in rounded shapes. 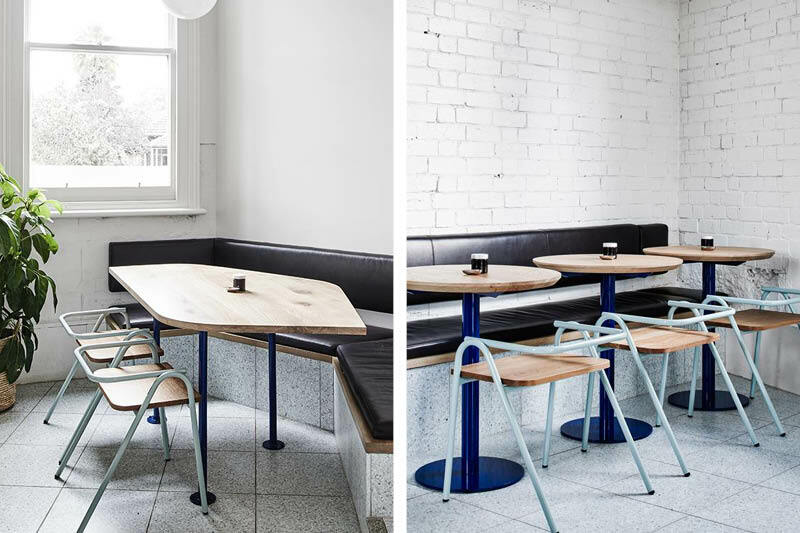 In the Australian restaurant Merah, the design team played with rounded edges on the tables and seating. The curvature is an unexpected twist on the standard table and chair. Modern housewares brand Commonplace uses a White Oak U-shaped “catwalk” as their central display in their Milwaukee, Wisconsin, store. And finally, a White Oak table specified in a round or oval shape with a knife-edge is a great addition to any commercial dining space. Bonus: White Oak is one of the most durable and responsibly sourced timber species in North America, which makes it the perfect choice for commercial tables. Half Hurdle Chair with White Oak seat in Merah. 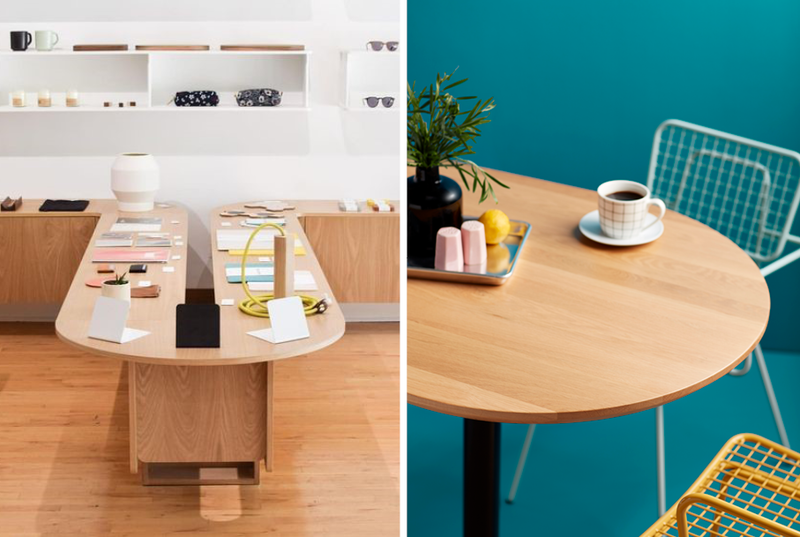 Left: White Oak U-shaped display table in Commonplace. Interior space designed by Tretow. Right: Oval White Oak table made by Grand Rapids Chair Company. 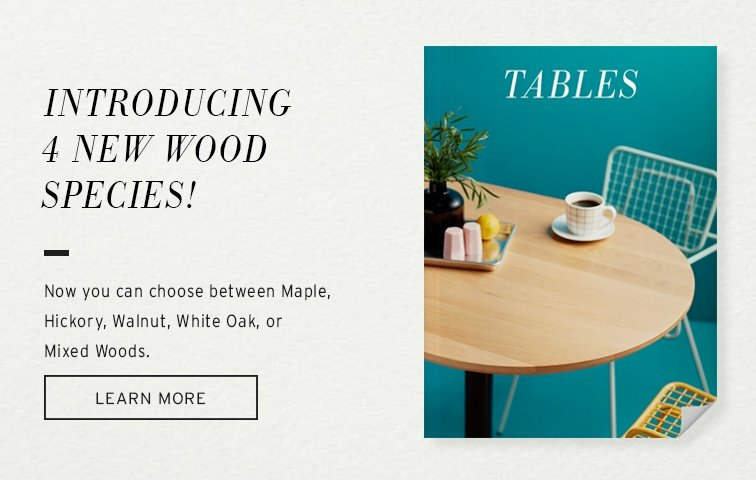 Get pricing and information on our White Oak tables here. It seems like you can’t read any design blog or magazine without seeing terrazzo. Add White Oak, and you have the makings of an eye-catching, spectacular palette. Depending on the terrazzo, the combination can be a striking contrast, as seen in Smallfry Seafood, a fish and chip shop designed by Sans-Arc Studio. The rustic Oak stools provide a cheerful yet dramatic contrast to the sparkly blue sea-inspired bar. A similarly playful combination can be seen Toki, a cafe in Amsterdam. For a more subtle, glamorous feel, Studio David Thulstrup paired White Oak with two types of muted terrazzos and light pastels. 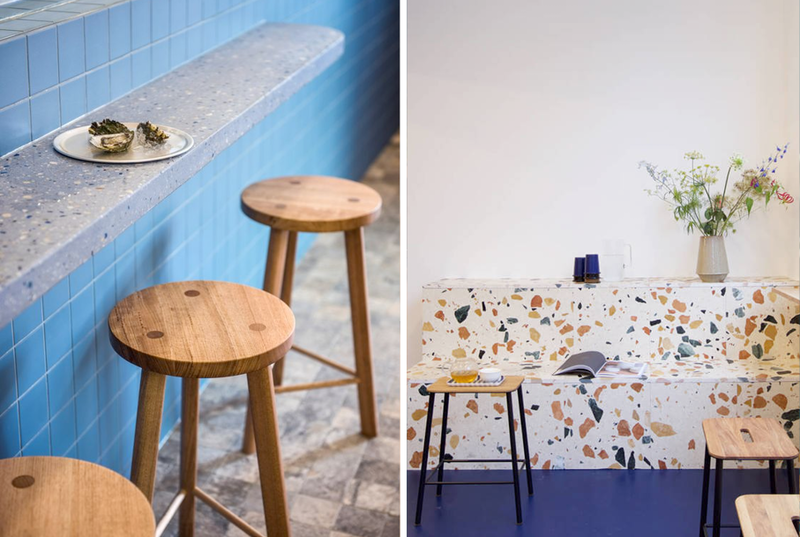 Left: Rustic Oak stools with blue terrazzo in Smallfry Seafood. Design by Sans-Arc Studio. Right: Large-scale terrazzo adorns the steps while White Oak and steel stools are placed throughout in cafe called Toki. 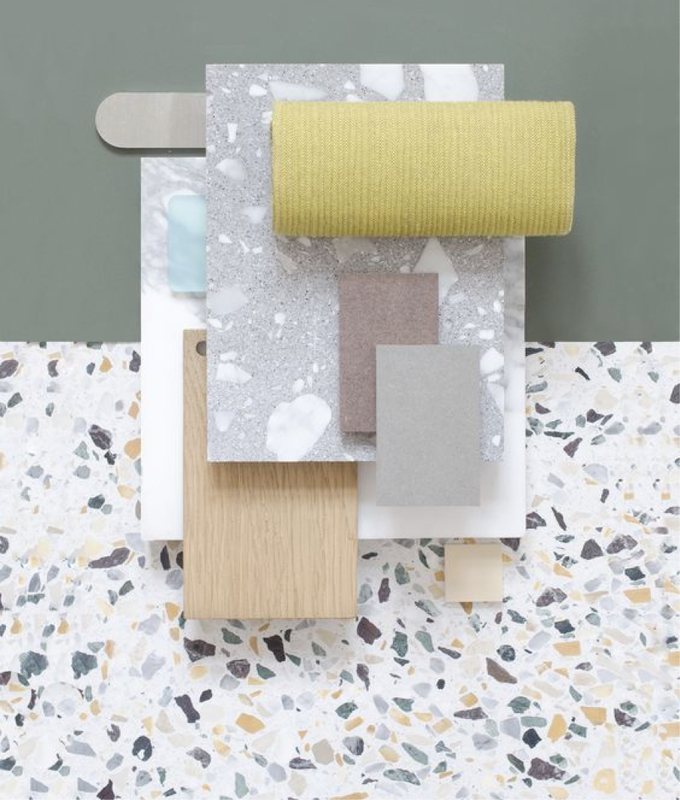 A design palette by Studio David Thulstrup featuring White Oak and two types of terrazzo. 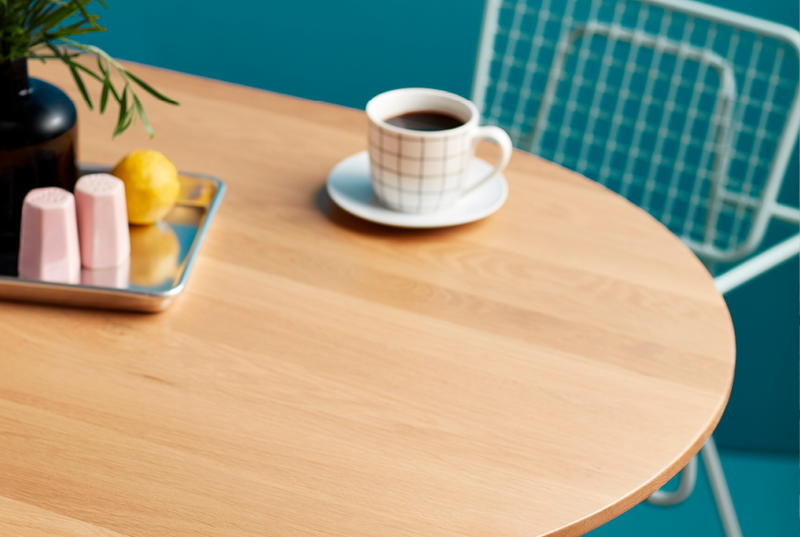 Last but not least, you’re sure to find White Oak tables and chairs paired with colored steel popping up in cafes near you. It’s no wonder–powder coating steel is a simple, durable, and cost-effective way to add instant panache to any space. 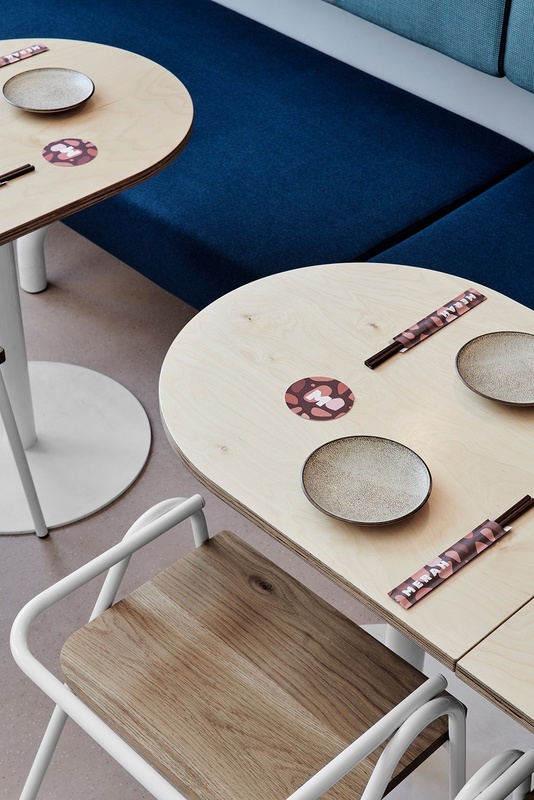 It can be subtle like the cobalt blue base and White Oak chairs in the cafe Finlandia Caviar. Or, take it up a notch by choosing a seating collection bursting with personality. For instance, the Hurdle Collection features sturdy steel tubing with a rounded White Oak seat (see trend #1). Against the color, White Oak’s distinct cathedral grain pops. Just as the other two trends, it’s unexpected and fresh way to feature this wood. 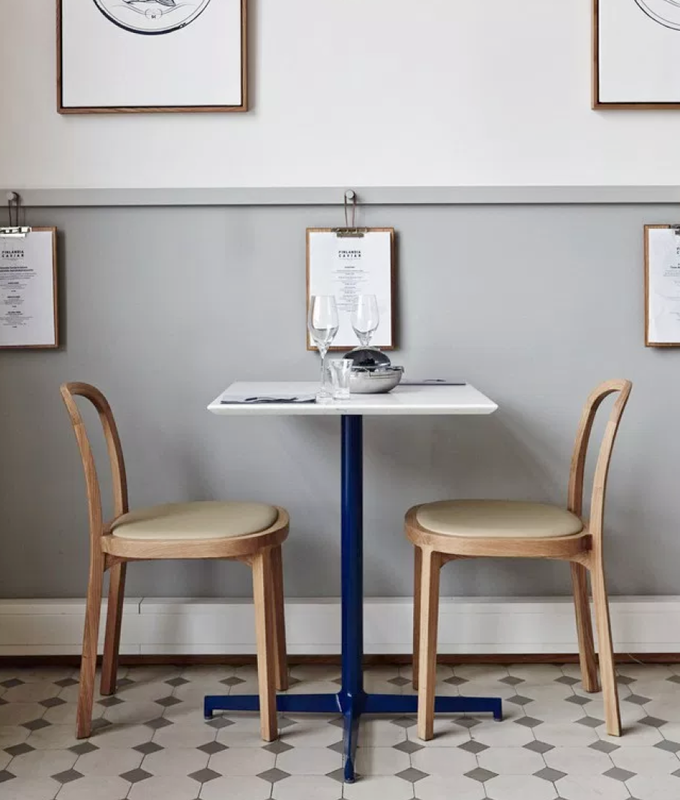 A cobalt blue base paired with White Oak chairs at cafe Finlandia Caviar. 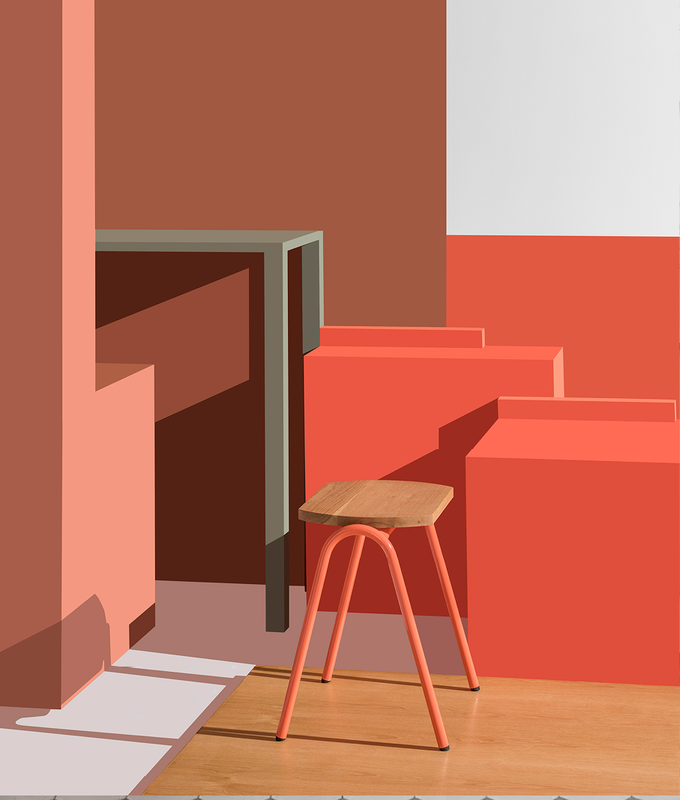 The Hurdle Low Stool finished in Salmon Orange with a natural White Oak seat. Designed by Dowel Jones and manufactured by Grand Rapids Chair Company. If White Oak is wrong, we don’t want to be right. It’s timeless and can be easily updated with a few simple edits like rounding the corners, pairing with interesting materials like terrazzo, or simply adding color. If you’re interested in using White Oak in your space, check our new table collection which features this species as well as our Hurdle Collection.